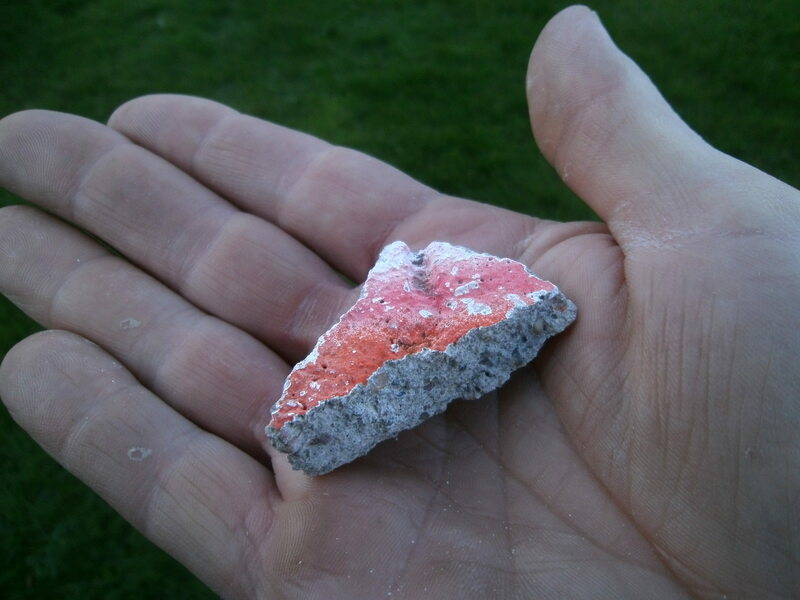 That is an actual piece of The Berlin Wall. It sits on my mantelpiece at home and reminds me that things can change and things do change. No matter what the politicians and media tell us, anybody who witnessed the wall being toppled will testify to the power of people. “The truth will set you free.” Jesus Christ said those words long before Jimi Hendrix. Not everybody knows that. The media doesn’t want you to know that either. In Ireland at the moment there is a peaceful revolution taking place. We, the people, have endured six years of austerity measures. Big taxes on this and that and everything. Recently our government decided to privatise our water and charge us ridiculous prices for the pleasure of having water come from a tap. But this time the people have had enough. One by one we started to get off our knees and rise up. Marches were organised. Social media was used to spread the word. I put my shoulder to the wheel by getting onto the local radio shows to spread the news to the non-internet folk. The country started to awaken, one by one. Last Saturday, the largest, most peaceful march in the history of our country took place. 150,000 people pulled on their overcoats and went outside in God’s free rainfall and marched shoulder to shoulder in defiance of the latest tax. Some marched for anti-privatisation of our water and others marched simply because they had nothing left to give. The cuts had taken their toll on the people. The following day there was one newspaper in particular which caught my eye. It showed a cartoon scene of a riot taking place with the heading “Open revolt.” It caught my eye because the cartoon scene was an attempt by the newspaper to discredit the folks who marched the previous day. There was no violent scene to show, so they invented one. I bought the paper and kept it safe. Fast forward to the following Friday (two days ago). In a last ditch attempt to give all who were opposed to extra water taxes and water meter installations a bad name, the daily newspaper had an actual photo of a riot on its front cover. In tiny print below, the caption mentioned that the photo was from Brussels. 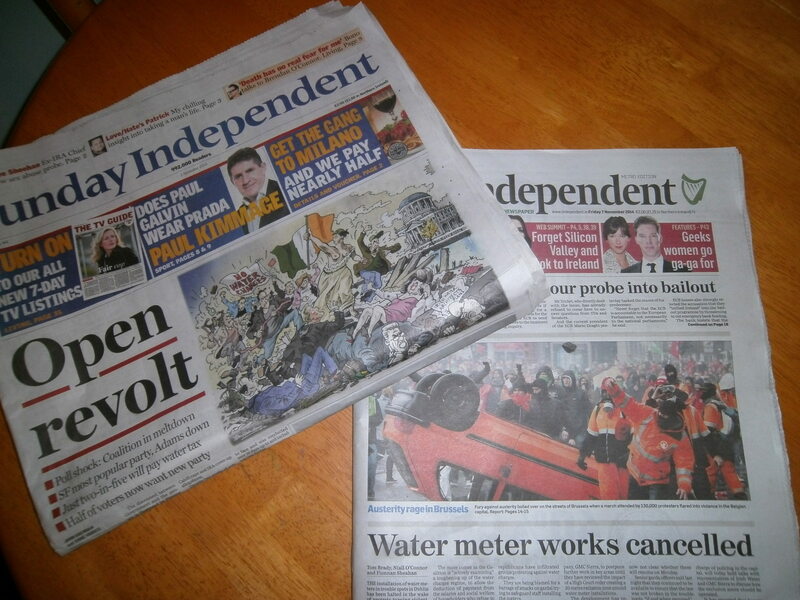 But IN LARGE PRINT was the headline “Water meter works cancelled” along with a story that people had started to get violent with the men installing water meters. The mission of those two front pages was clear to me. ; to discredit anybody who didn’t say ‘yes’ to the government’s water agenda. Lots of folk don’t read newspapers but lots of folk will catch a glimpse of the front pages on their way past newspaper stands. The subconscious will fill in the blanks. This is the oldest trick in the media book. I called it! I had enough of this carry on. I called it on Friday on social media. On Saturday a few folks ran with my theory. One guy uploaded a video about it. Another did a breakdown of the front page to dumb it down for easy learning. They didn’t credit me in their work but it’s not the end of the world. The ego is the invention of the devil…(evil laugh). Last night the video had gone viral. The other guy’s post had done the same. But I see this morning that his post was removed. “They” haven’t removed my photo because my photo and my theory belong to me. Just like the theories of the newspapers. The cat is out of the bag. Just like 25 years ago when the first few ordinary, everyday folk made it to the other side….the tsunami of people and people power followed. I reckon this date is reserved by God for God’s people, and God’s gifts of freedom and His natural resources. “The truth will set you free” – He wasn’t lying after all. Power to the people! Walls will tumble again.